A writing and thinking assignment. It can be done alone, but you can invite a supporter or community member to help you plan! When you’re starting an open project (or restarting a project, or starting a new phase of a project), it’s important to outline and plan for the work ahead and share that plan with any potential contributors. We’ll do this using a text document we’ll call a “roadmap, ” Like a road map you’d use while traveling, this document will help to identify where you are now and how to reach your project’s end goal, as well as the course that you will need to take to get there. Your roadmap summarizes your vision and includes a timeline for tasks. This a great tool for you– it helps you schedule work and track goals– but it’s key for anyone who might contribute to your project, so they know what’s currently happening on the project, and what’s next. As you make your Roadmap, you may realize there are dependencies among different tasks. For example, you might need to define the structure of your database before you decide on a strategy for searching it, or you might need to secure a venue for an event before you decide the number of sessions or speakers you’ll invite. Creating a Roadmap helps you get a sense of not only all the steps that have to be done on a project are (there are always more than we anticipate), but also how to schedule tasks and plan work efficiently. Check out this example Roadmap from the STEMM Role Models project. The timeline of tasks is the probably most important part of the Roadmap so as a warm-up exercise, you’ll decide on project milestones which are significant turning points or events that will move the project forward. Review the different types of milestones outlined below, and decide which ones are most appropriate for the kind of work you’ll do on your project. Project Status Goals. If you’re creating a software project, a milestone could be completing a specific feature or a release (see the section on Prototypes, below). Dates. If you have deadlines or a set span of time to work on this project, use those dates as milestones. If you’re working in formal education, dates in the academic calendar can be natural milestones. Events. If your project will be demoed or shown at an event or conference, or if your project involves planning an event, then you’d want to create milestones around that event, for preparation (such as sending invites, arrange for space, etc), running the actual event, and follow-up after the event. (more or events and convenings in section X.
Timeframes. If your project is a longer, ongoing effort and you don’t yet have any hard deadlines, you may want to create short, medium and long term milestones. 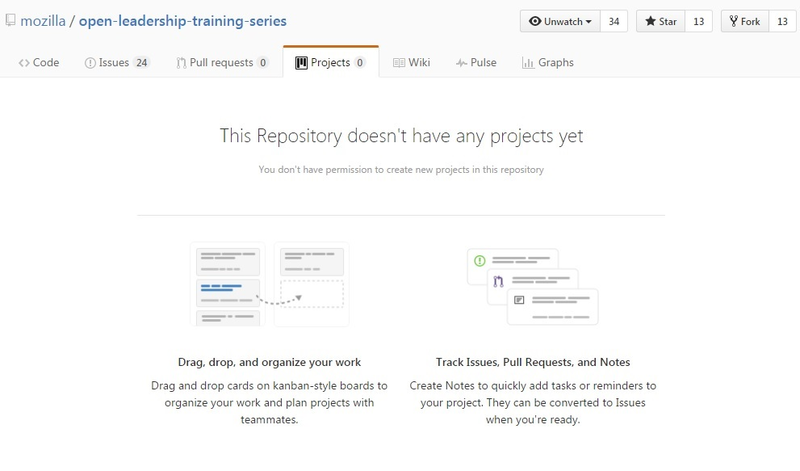 Another way to track your project’s progress is use to use GitHub’s Projects. This feature allows you create kanban-style boards to manage tasks, take Notes to quickly add tasks or reminders to your project which can be converted to Issues when you’re ready. As you plan your project, you might want consider when you’ll create and test prototypes. A prototype is an early, unpolished version of your project or a feature of your project, created specifically for testing purposes. Prototyping is the act of testing a feature or solution by building or making a rough or mocked-up version of that feature. It’s important to note the difference between a prototype and an MVP (Minimum Viable Product). The MVP is a stripped down but functional version of your project that’s ready for use. The prototype is often incomplete, and not for real-world use, long term use or distribution.